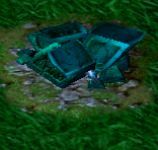 Whenever a creep enters within 1000 range, this tower applies a debuff on the creep that periodically stuns it for 0.15 seconds and deals 200 spell damage to it every 1 second. The debuff is removed if the creep is attacked 7 times. Repeated applications will stack damage and attacks required to remove the debuff. Hit count from 1 to 7, stun duration from 0.1 to 0.15. Whenever a creep enters within 1000 range, this tower applies a debuff on the creep that periodically stuns it for 0.2 seconds and deals 400 spell damage to it every 1 second. The debuff is removed if the creep is attacked 10 times. Repeated applications will stack damage and attacks required to remove the debuff. Whenever a creep enters within 1000 range, this tower applies a debuff on the creep that periodically stuns it for 0.25 seconds and deals 600 spell damage to it every 1 second. The debuff is removed if the creep is attacked 15 times. Repeated applications will stack damage and attacks required to remove the debuff.